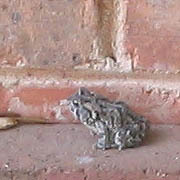 a loaf of bread, a stick of butter, and eye of toad. 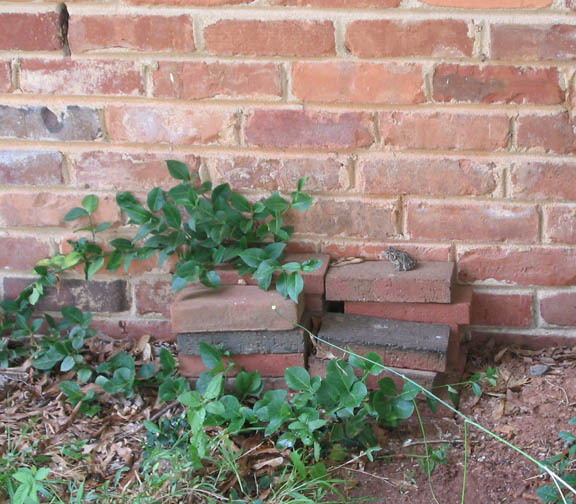 We have a little friend who lives by our air conditioning unit near the spigot outside. It (or another one that looks just like it) was there last year too. I think it likes to stay there because we’re in the midst of a drought, and the AC unit forms condensation, so it can get some moisture there. 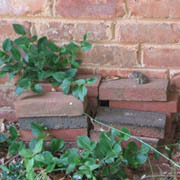 Plus those bricks make a great hidey hole, and since it’s under the overhang, it can stay in the shade for the warmest half of the day. Steve pointed the toad out yesterday, so today I took Emily out to see it. We got the ground just a little bit damp near where it is as an act of kindness, although for all I know it likes the dust. Good luck, little toad! I hopped up the road to Davidson to visit The Needlecraft Center and found the owner, Elaine, literally on her way out the door to market. She’s going to investigate getting some Blue Moon Fiber Arts stock for her store, including Socks that Rock. 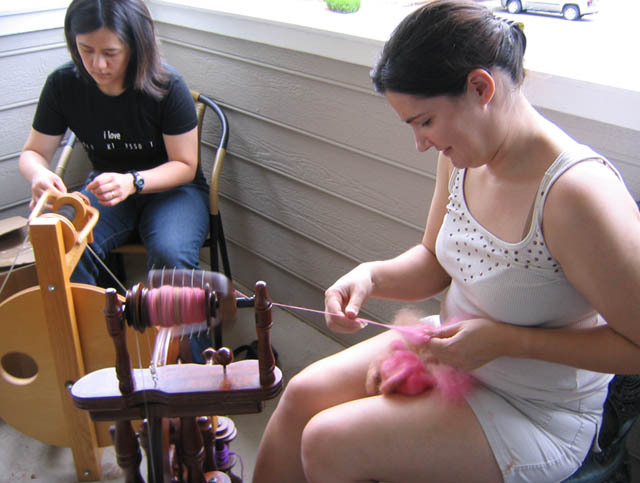 The nice thing about The Needlecraft Center is that the staff are all very experienced knitters, so they know quality when they see it. I showed her my Tofutsies socks (okay, sock and a half) since she hadn’t seen that yarn and was interested. The Needlecraft Center carries Jojoland brand in several varieties, including cashmere and laceweight, with truly beautiful store samples knit up. I resisted temptation, as I have way too many projects already in line, both paid and unpaid. Speaking of going to market, I need to hit the grocery store, as we are out of several staples. The following jingle from my childhood is stuck in my head, and so now I share it with you. Enjoy it before it gets yanked for copyright infringement. ETA I suppose I could make it “cunning knits and knitting kits” but that may be too “in.” Hm. Why is the entirety of this post of mine on this person’s blog? Is it some kind of a front for a spammer? I don’t get it. Worst part: their layout is nice and it looks better on their page than mine. D’oh! I think I may stop offering the cotton hats. I mainly offer them out of pity to the Browncoats who are allergic to wool. The cotton hats take longer, are more difficult to knit due to the unyielding nature of cottton, and the materials cost more. The yarn is hand-dyed in South America and it’s very difficult to get consistent from dye lot to dye lot, which is troublesome when people understandably expect their hat to look like the picture on the site. I had to rip out three inches of yellow I knitted last night because the variegation was such that it looked more tiger-ish than Jayne-ish. Two half-skeins were available that matched that didn’t have the variegation. What a pain in the keister. 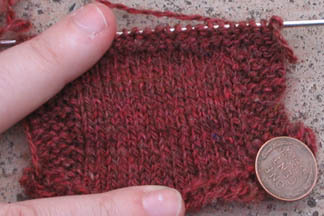 I knitted a test swatch on size 0 needles of the red/copper handspun I made. Feels a bit scratchy, but it looks nice! Although this produced 7 stitches per inch, I think it will be more pleasant to knit on slightly larger needles. I’ll rip it out and swatch it again at some point. Right now I’m nowhere near ready to knit with the yarn, what with it only being about 2/3 spun. Today, I need to call around for more summer camps for Emily, continue knitting up this final cotton Jayne hat, and then move on to more wool ones. Everyone currently in line should get theirs by the summer Serenity screenings, but I don’t want to leave anything to chance. It’s been a busy morning of writing Jayne notes, boxing up hats, and generally doing the non-knitting tasks that make the hats super-shiny. Back to work! Pirates of the Caribbean 3 was a good movie, but they certainly didn’t let plot get in the way of a good special effects/action sequence. Don’t get me wrong, I enjoyed it, but the best review of Pirates of the Caribbean 3 I’ve seen so far has actually been a review of PotC2 from the always funny Ask a Ninja. Pretty much! Best just to lie back and enjoy it. Which we did. Thanks for the babysitting, Mom! I was going to post it later, but someone asked, so this is what the design is. The full-color will be the big issue as far as cost and quality, I think. I had someone who isn’t familiar with the world of Firefly tell me that they would think “website designer” if they just saw “designer” on there. These are meant to go out to people who are specifically interested in Jayne hats, so I’m not sure whether it’ll be unclear or not. We’re looking at another design for regular use. I think this is fine, but I’ve also been looking at it for a while, so now I’m wondering. Thoughts? Add a “custom knits and knitting kits” line? Add “knits” to the “designer?” A great design is a great design, but it also has to serve its commercial audience. has made me some truly awesome business cards, and I am seeking a good business card printer. Obviously, cheaper is better, but it’s more important for me to have good quality than the lowest price. Ponk’s cards just rock too hard to get screwed up. Anyone got any tips or sources? 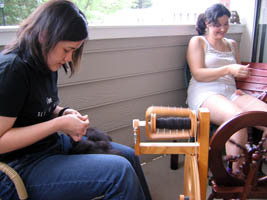 Had a great time at Turtlegirl76’s place today with at an informal spinning session. 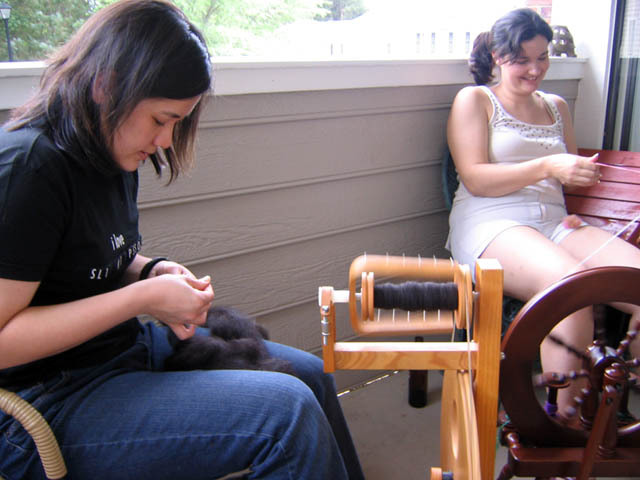 We continued to spin up what we had on our bobbins, tried out a silk hanky with uneven results, and Illiane was kind enough to share some absolutely gorgeous black alpaca with us. We also used Turtlegirl’s scale to measure out fiber. I really need to get one of those. There was also, of course, knitting. I swatched the red I’ve been spinning on size 0 needles. It looks like it’s too tight, so I’ll do another piece on size 1’s. A pic will be posted it’s done. I’m feeling good about this as a sock yarn. Down side: I’m getting sick of spinning it. Emily continues to have adventures in language. We’ve had lots of fun playing today, all three of us. Steve and I are looking forward to seeing Pirates tomorrow while Emily has a good time at Grandma’s. Yay! No, that’s not true. I actually like lavender, but realized a while back that it gives me headaches. So I avoid strong doses of it now. That’s unfortunate, because apparently the laundry detergent I picked up at a local “green” grocer has scads of it. I’m currently rinsing my clothes for the third time, this time with vinegar in the water, in an attempt to get the smell out. So if anyone in the Charlotte area wants a bottle of nearly unused Ecover laundry detergent scented with lavender, let me know. It smells nice, it’s just that I’ve already got a three-day headache going, I don’t need any more help with that. On the spinning front, I decided that the easiest way to determine whether or not I wanted to ply that red was… well, to ply that red. 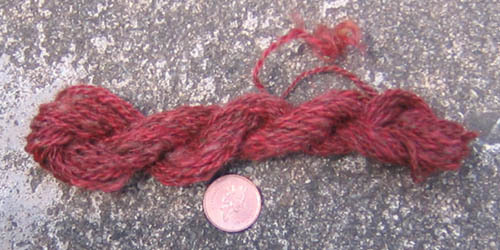 So I spun up a very small quantity and plied it. I like it. I want to knit it up, but can only find one size 1 DPN. It’s quite mysterious. Maybe I can snag some more needles when I finally take that road trip to Greer for the closing of Yarns Forever. The owner’s dyeing business is going so fantastically that she no longer has time to maintain the store. She had some unusual stuff there last time I visited, so I’m hoping to find something interesting. I’m looking for a time to see Pirates of the Caribbean with my husband. If we can’t get out to it, we’ll see it on DVD, but this does seem like one that would go well on the big screen. He’s just been working like a madman, so it’s tough to find time to get away. We could both use more sleep, and late night calls from work don’t help. That’s the price you pay for being indispensible, though! Today, miscellaneous errands and more Jayne hats. Woot! ETA: My mom’s volunteered to watch the kiddo on Monday so we can go to a movie. Double woot! Thanks Mom! This was supposed to be the week I didn’t have to do anything for girl scouts because I’d been pulling a lot of extra weight while my co-leader had mono. She was going to handle everything with another mom. Instead I wound up having to bring half the stuff for the picnic and coordinate various things. My co-leader was going to bring the sandwiches and drinks. I just got an e-mail from my co-leader saying that she’s been called in to an emergency meeting and will probably be at work until midnight. The meeting’s in an hour and a half.